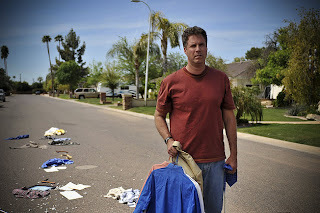 The first five minutes of Everything Must Go are very bad for Nick Halsey (Will Ferrell). He gets fired from the company he’s worked at for 16 years, has his car repossessed, and returns to his suburban Phoenix, Az. home to find that his wife has left him, but not before strewing his belonging across the front yard, changing the locks to the house, freezing their bank accounts, and cancelling Nick’s cell phone service. Alone and adrift, Nick settles into the recliner situated on his lawn and, with a fridge full of Pabst Blue Ribbon, imbibes the alcoholism that caused this adversity in the first place. City ordinances and complaining neighbors soon convert camping outside into a yard sale, an obvious metaphor for Nick finally unloading his past. Vinyl records recall memories of Nick’s drunk, deejay dad; a yearbook reminds him of an old classmate (Laura Dern) he decides to visit; a projector allows him to revisit old home movies. We learn more about both Nick’s flaws and dormant heart thanks to two strangers who wander into his orbit. In an example of art imitating life, a terrific Christopher Jordan Wallace, the 14-year-old son of slain rapper Notorious B.I.G., plays a fatherless youngster who mirrors Nick’s expressionless melancholy as he bikes throughout the neighborhood looking for someone to just teach him how to play baseball. And, across the street is a new pregnant neighbor, Samantha (Rebecca Hall), whose absent career husband portends a woman experiencing the same early woes that eventually plagued Nick’s wife (whom we wisely never see). Directed and adapted by Dan Rush from a Raymond Carver short story, Everything Must Go is at times too minimalist for its own good, and the storyline progresses to a predictable end despite its the semi-surreal setup. But, the film works on two particular levels. First, it is an earnest fable about a man who must confront and let go of his past in order to embark on a better future. Ferrell dials back his normal oafish shtick in favor of the low-key humorous persona he used in Stranger Than Fiction. Second, there’s a commentary about the artificiality of suburbia, in which denizens suffer the same problems as everyone else but craft covenants and regulations intended to wall away life’s ugliness, even the peculiarity of a man living with his own stuff on his own lawn. Everything bad, indiscreet, or just unusual must go…out of sight and mind.